I found myself collecting strange cast offs in the local flea markets recently. I’ve never been much of a collector of objects. Having so many thousands of photographs, stacked nearly floor to ceiling high on the shelves of my studio, I always thought I had enough ‘things’ already. 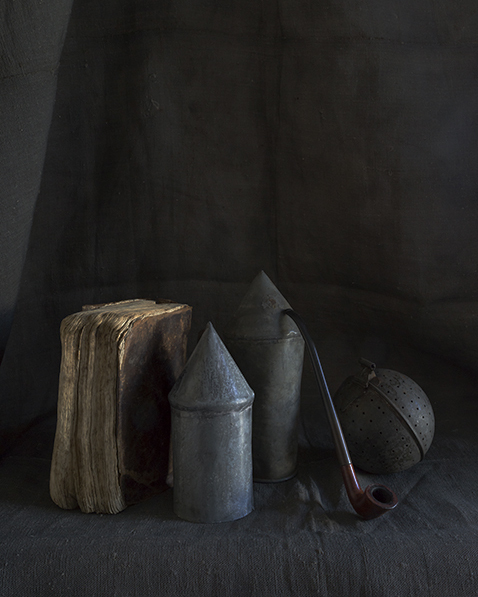 But these old odd forms that call out to me are suggesting themselves as worthy objects to consider in some sort of still life way, still lives being something that never really were part of my vocabulary as a photographer until last year when the urge first came to me. Since then I periodically find myself simply staring at some of these objects and turning them slowly around so that each new aspect of their form reveals another possible shift in my first or overall impression. It is as if their truest expression of their ‘objectness’, their ‘personality’, suggests that I stop and look harder – which is what I think photography is really all about – looking harder at what we may think we already know – and by doing that I get glimpses of their hidden sweet spot, and once you know where that is you want to explore it. This image is more of an introduction to the new arrivals than a worked out still life. It’s what I do first to see how they stand, their relationship to each other, the way the surface holds the light, the sense of scale they emit in the space they occupy. Surprisingly, some small forms present a sense of scale greater than their real size, and it helps to know that about them for future use. It’s kind of like an audition where the cast of new arrivals struts their stuff for the director. Today the book and the pipe came home with me and we are getting to know each other. This entry was posted in Uncategorized and tagged Bonnieux, France, Interior, Still Life on January 10, 2015 by joelmeyerowitz2014.